Preheat the oven to 400 degrees. Line a baking sheet with a nonstick baking mat and set aside. Drop about 1 1/2 tablespoons of batter for each cookie onto the prepared pan, leaving at least 4 inches between the mounds to allow for spreading. Bake for 10 to 12 minutes, until lightly browned. Let the cookies “settle” for a couple of minutes and then, while they are still hot, lift them off the baking sheet and bend each cookie over a rolling pin or place it into a baguette mold so it takes on the shape of a curved roof tile. Allow them to cool long enough so they maintain their shape when removed. Let cool, and store in an airtight tin. Your face just glows whenever you mention our beloved Julia. Mine too! We all miss her. 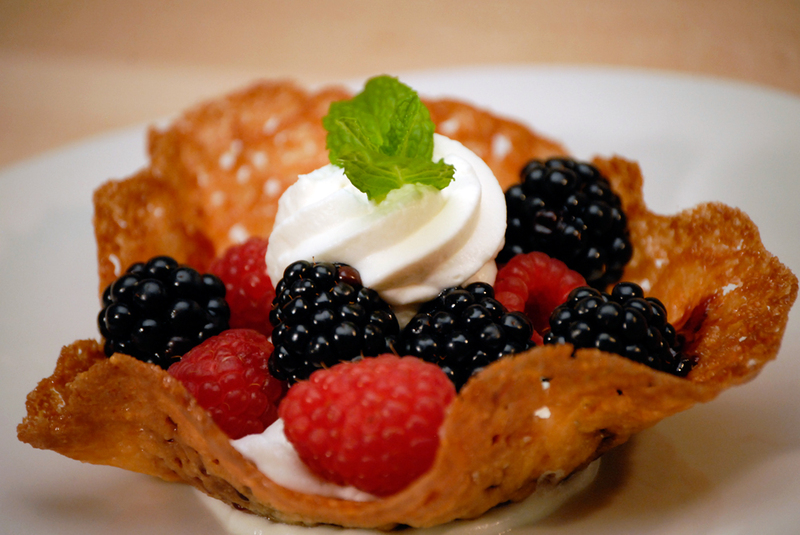 My teenage son and I really enjoyed your show with your good friend when you made these tuiles. You both seemed to enjoy your time together and it was very nice to share with you as well. It made us want to make these cookies. Thank you for putting the fun into cooking for us both. I had a hard time with these cookies. They didn’t flatten out, at all – they puffed up like regular cookies and wouldn’t bend to any shape, they just fell apart. I followed your recipe exactly – not too sure what I did wrong, any suggestions?